So people, I know how hard it can be to find a reliable online to print photo books, thank you's and various invitations - but I feel lucky to have realized how EASY to it is to use Shutterfly for what I needed. 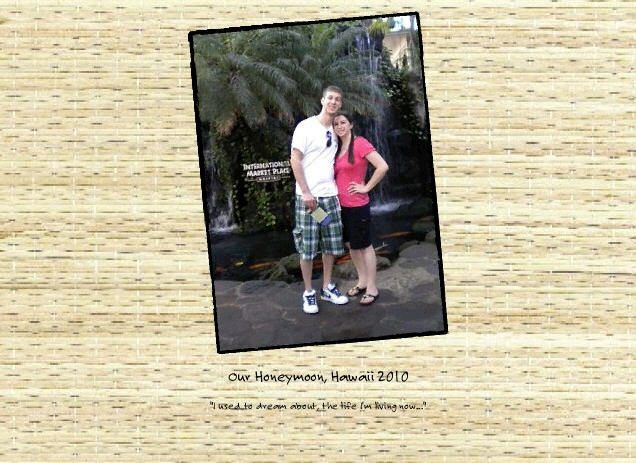 I used Shutterfly to create my fabulous honeymoon album this past year and while I finally just putting the finishing touches on it - I look forward to receiving it just in time for the holidays to share (and show my family photos of Hawaii while it's 40 degrees out). 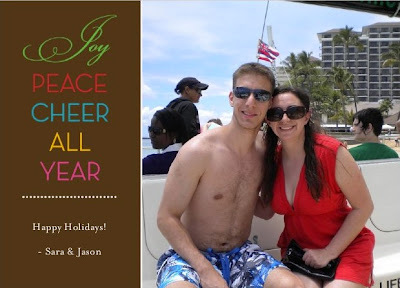 I was so happy with the way the wedding album turned out, we opted to do our very FIRST holiday card as husband and wife! It was even easier than I imagined - we had the photos already loaded into an album so it was just a matter of picking which one we liked best and then figuring our if my name or Jason's went first - yes, that was our biggest issue! We are placing the order this week and plan to send them out to our family and friends and Shutterfly made it really easy to do, I actually did it while I wrote this post! Check out the holiday card! Also, since I mentioned it - here are two snap shots from our honeymoon album made via the Shutterfly photo book option! This is the cover page! This is a snap shot of a two-page spread!